For riddles for kids work to keep minds sharp and logic sound. They are a fantastic way to stimulate young minds and improve critical thinking skills. Our collection is for children to enjoy while exercising their brain. 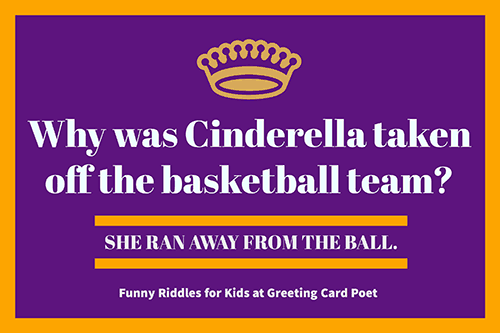 Most of them are gentle challenging riddles that are easy to understand and sure to stump a few friends and family members at the next get together. These can be used by the teachers to make their classes more active and entertaining, and even with parents who can enjoy solving riddles with their kids. Once they get it though, they will be on the hunt for more. Much fun awaits you here, so read on and enjoy! I have no legs. I will never walk, but always run. What am I? What is a frog’s favorite game? What is an insect’s favorite sport? I am light as a feather, yet the strongest man can’t hold me for much more than a minute. What am I? Why was Adam known to be a good runner? He was the first in the human race. How far can a bear walk into the woods? Note: When folks say, “We love your riddles,” we encourage them to submit their own via our contact page. Please do. And, please note how we don’t delay your satisfaction with a show answer button. Immediate gratification! Check out animal puns on dogs, cat, horses and frogs. What’s a sheep’s favorite game? In a one-story pink house, there was a pink dressed person, a pink dog, a pink fish, a pink computer, a pink chair, a pink table, a pink telephone, and a pink shower. Everything was pink! There weren’t any stairs, it was a one story house. Duh. He wanted his quarter back. Marbles, you don’t want to lose them. You might like our extremely corny jokes. I have rivers, but do not have water. I have dense forests, but no trees and animals. And, I have cities, but no people live in those cities. What am I? I was born big, but as the day passes, as I get older, I become small. What am I? I will always come, never arrive today. What am I? I am full of keys, but I cannot open any door. What am I? How do shells get around in the ocean? People always buy me to eat, but they never eat me. What am I? 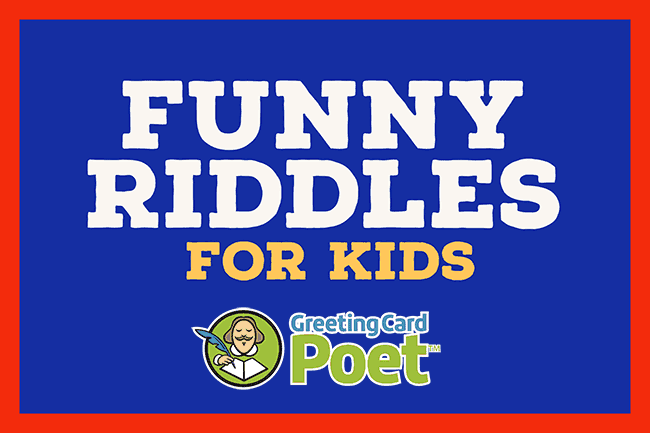 Note: These funny riddles for kids promote critical thinking, creativity and dare we say: humor. The one who makes me does not need me, when he makes me. The one who buys me does not use me for himself or herself. And, the one who uses me doesn’t know that he or she is using me. What am I? When the water comes down, when it rains, I go up. What am I? What is blue and smells like red paint? Imagine you’re in a room where the ceiling is slowing fallings and the floor is slowly rising. There are no windows or doors. How do you get out? I always run but never walk, Have a mouth but never talk. What am I? I have keys but no locks. I have space but no room. You can enter but can’t go outside. What am I? Sara’s mother has four daughters. One is called Megan, one Molly, and another is Brenna. What is the name of the fourth daughter? If the wind was blowing 5 mph west and you placed a rooster’s egg on top of a pink house that was slanted 3 degrees east, what direction would the egg roll? You will throw me away when you want to use me. You will take me in when you don’t want to use me. What am I? He only had one pupil. A king, queen, and two twins all lay in a large room. How are there no adults in the room? They like to hunt Knights. What kind of flower does everyone wear on their faces? Name a popular four letter sport that starts with a “T”. What did the boy cat say to the girl cat on Valentine’s Day? Tip for teachers: Use these riddles on a one a day basis or to fill in when you have a few minutes left to leave for lunch. What is something you can easily hold in your right hand but cannot possibly hold in your left hand? Your left elbow or hand. Going forward, I’m heavy. Backwards, I’m not. What am I? I am an odd number, but take away one letter and I become even. What am I? What 5 letter English word can be pronounced the same even with 4 of its letters removed? It is late, 3 am, you are awakened by a knock on the door. It is your parents. They are hungry. You have a can of sardines, a box of crackers and a bag full of apples. What do you open first? 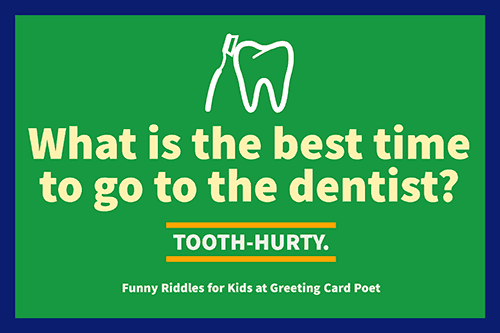 If these fun riddles for kids brought a smile to your face. Riddles are a great way to connect with kids. 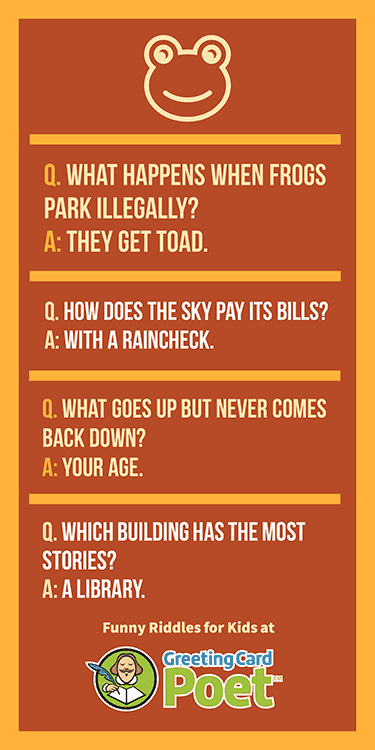 Were you stumped by these riddles at all? Or, maybe you have some of your own you’d like to share? Please use the contact page.